This starts with the Maragaia in Santa Luzia and ends at the Church of Santa Luzia. When descending towards the sea, this route crosses the viticultural landscape, a UNESCO World Heritage Site, to the Lajido. 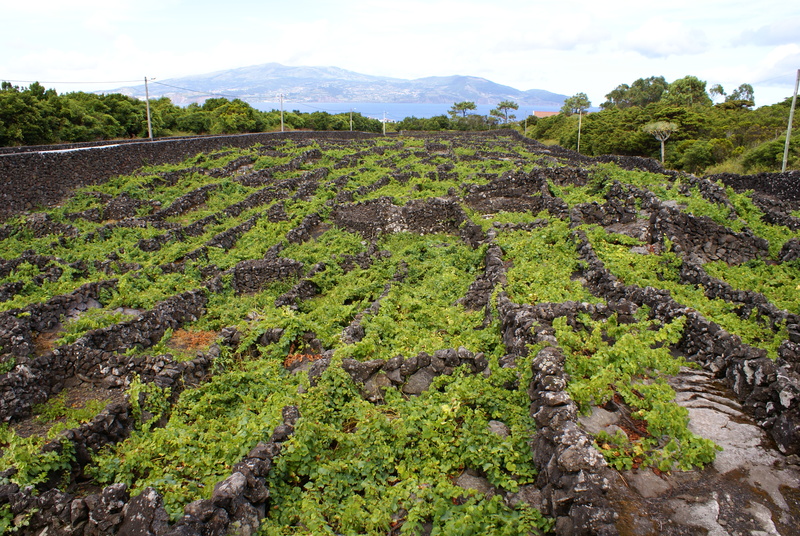 This trail is accompanied by “rilheiros” tracks in the lava made by the carts carrying the wine. Passing through Lajido, where you can visit the museum and observe various geological formations present in this location. Following way to the Forno dos Frades, a site that has deserves some attention. Following path after passing the church, is continued through white wooden woods (Picconia azorica), heather (Erica azorica) and incense (Pittosporum undulatum), among others. Finally, return to the Church. This path crosses a protected landscape area, and are asked to not take fruit in any part of the route. A trip through the Pico which is presented in its purest state. This begins Cross Road, next to a house of the Forest Service, and ending in the village of Riverside. This trail allows to know and discover the lagoons of Caiado, Lagoa Seca, Lagoas do Peixinho, Paúl Lagoon, the Natural Reserve of Caveiro, an area with high and captive bogs and blanket bogs (Sphagnum sp., Multicaulis Eleocharis and Juncus sp. ), holly (Ilex perado ssp.azorica) and Cedro-do-Mato (Juniperus brevifolia), with regard to fauna are the little stars (Regulus regulus inermis), Blackbird (common blackbird azorensis), woodcock (Scolopax rusticola ), among many others. 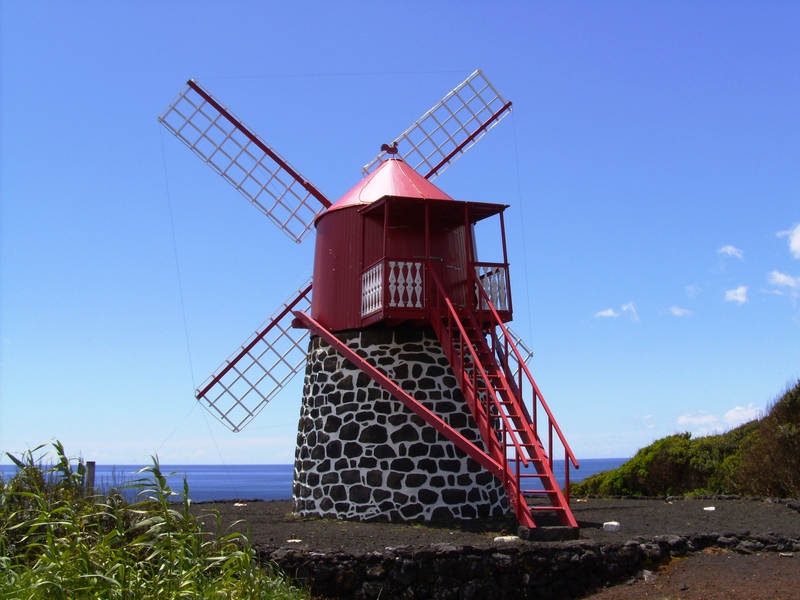 On days with good visibility, it is possible to see São Jorge and Terceira. Starting and ending in the center of São Roque do Pico, will be rising by an old cobbled stone path, still in good condition. This are 6 water mills, some rebuilt others in ruins, an old threshing floor in stone, allowing a panoramic view of the town of San Roque. Down to complete the route is accomplished partially in a water line and the last section is made through a very narrow Canada between stone walls. Starting with the viewpoint of Terra Alta, between the parishes of Ribeirinha and Santo Amaro and ending in the center of Santo Amaro, this trail shows traces of corrals vineyards, carving stone bridges, which disclose the importance of this section. agricultural fields accompany this trail demonstrating its viticulture. In approaching the coastline, it is a short detour to the Bay Corner, a small recreation area near the sea which is surrounded by local wineries. Resuming the path through the paved road comes to Santo Amaro, through the Park Holed a picnic area, and the old center of naval construction of the archipelago and the Shipbuilding Maritime Museum and Crafts School. Voltas paths – linear and easily, this covers an area of 6.3 km in 2 hours. Burros paths – linearly and medium difficulty, its length of 11.2 km can be covered in 3 hours and 30 minutes. This begins with the Captain’s Lagoon in the central highlands inside the Pico and ends in Cais do Pico. Starting a dirt track, through uncultivated pasture where are some endemic species such as cedar-do-Mato large. 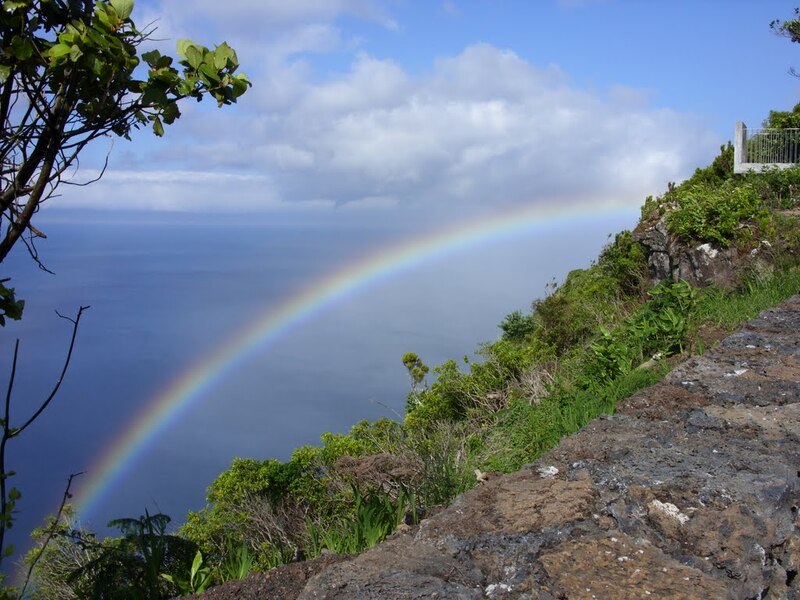 After around Cabeço Piquinho, attains a wonderful view over the north coast of Pico. If there is visibility you can see São Jorge and Graciosa. However, according to a pasture is a shady full of endemic species such as Uva-da-Serra, the Cedro-do-Mato, the puff pastry, the Sanguinho and Tamujo among smaller species is the yerba the captain and other species Orchideas, as regards the animals are here to Estrelinha, the smallest bird in Europe. Leaving this endemic forest, the well-deserved rest in the picnic area “The Source”. 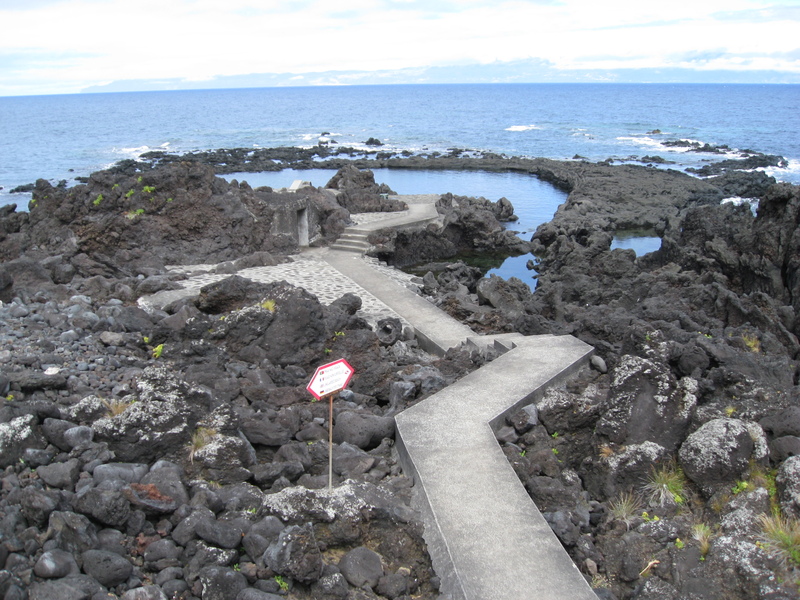 Following way, after entering the Cais do Pico, the right is the entrance to the Cave of the Canaries. A little further on, near the Convent of Saint Peter of Alcantara, the trail ends. This trail starts at St. John Forest Park, through two Mysteries of St. John and Silveira, these are lava fields resulting from eruptions that occurred in the Azores, and specifically in Pico, who do not have any explanation, thereby obtaining the name of mysteries of nature. This path shows the tide well of Bay Arruda consequently the bathing area of ​​Admouro Point, through verdoso tide well. Returning to the path follows to the bathing area of ​​Arinhas more forward is the Pico House and the Museum of Cheese of Pico, Mattock properties, the Church of St. John and the chapel of the Empire of the Holy Spirit. 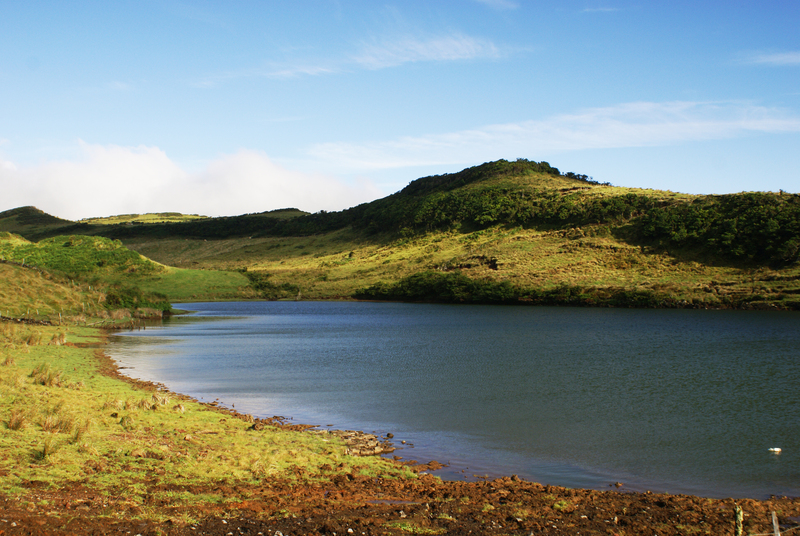 Following the sea, the Old Way, which leads to the Mill Rasa Ponta, then walking toward the slabs, is the mystery of the Silveira, a consequence zone of the volcanic eruption of 1720. Returning to the road, more ahead, the bathing area of ​​supply is expected, this place is known for its unique features of existing water. Following the path by the sea, is the Rego tide well and its small recreation area. After spending the holiday village diverts to meet the Canada Pau Rodrigues. Finally, reaching the Regional Road, the trail ends at the Chapel of the Holy Spirit, built in 1723, as a promise after the volcanic eruption of 1720, not to reach the place of Silveira. Getting in the Way of Atalhada, where are visible the marks of rilheiras of oxcarts used until recently. This trail allows to know the Porto da Baixa, a beach and recreational area and is characterized by the typical wineries and vineyard production corrals. Following the coast to reach the tip of Trumpets, it follows to the Calhau harbor in the Piedade parish. In the end this is an important stock azorinna vidalli. At this point you can choose to go another way to Manhenha. 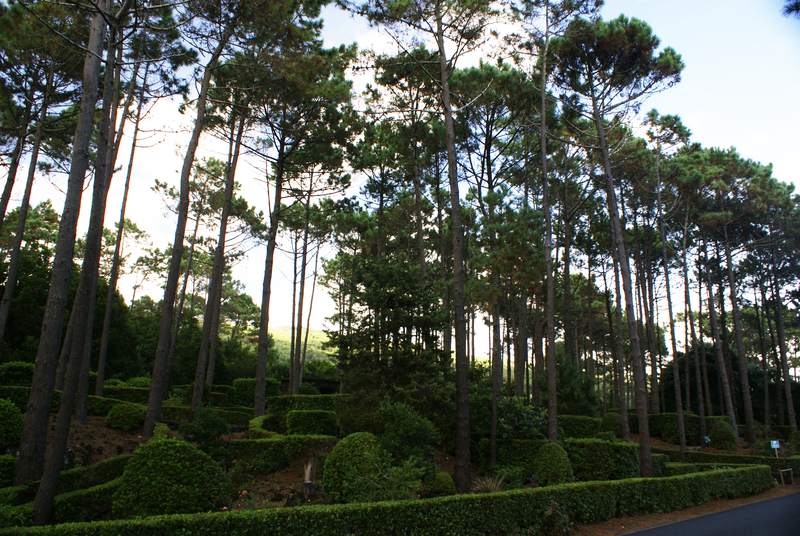 A journey that begins and ends in the North Prainha Central Garden. 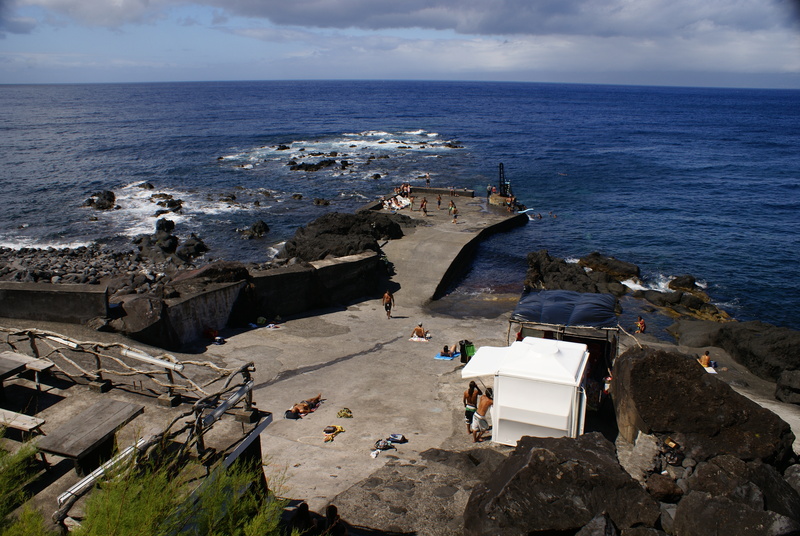 Up by farmland, one comes to a tunnel that leads to the “Ribeira path of Our Lady”, a group of houses, some of them abandoned, across the river that accompanies the journey, and to cross such bridges were built in stone, giving access to homes that are now considered as World Heritage Property of Pico Island. 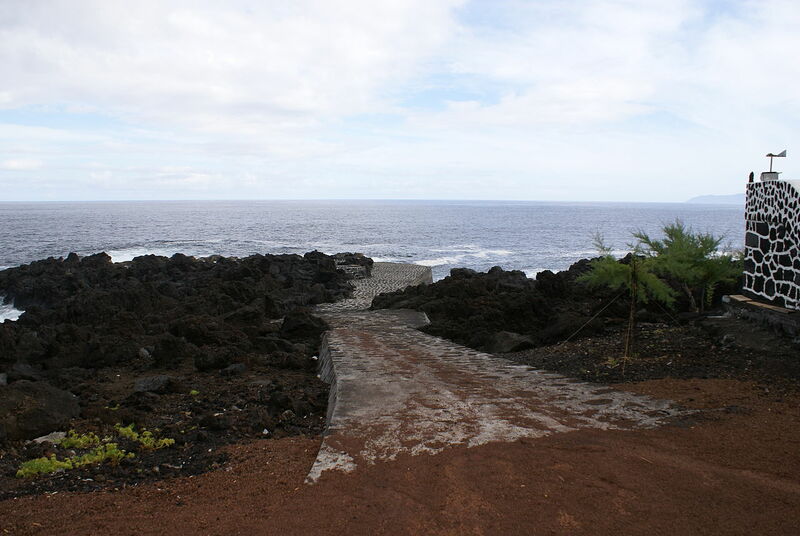 Then down to the Bay of Sand, which is the only sandy beach of Pico, and hosting the Wire House, a building that supported the operation of a major submarine telecommunications cable on transatlantic routes. Walking along the coast, past the Chapel of St. Peter to the bathing area, which was composed of a natural pool between basaltic rocks. Ahead is the Rooster Rock, a pierced rock by sea erosion. Resuming the path runs through the last part within the parish, to the beginning. Starting on the regional road between the Parishes of Saint Vincent and Santana, this ends in Lajido. A path that leads to the Vigia da Baleia, where you can enjoy a view over the channel and St. George. Reaching Santana Cabeço, down up to Gasparal Bay, an area used as a shipment of Verdelho wine barrels were exported to. Following the coastline, you arrive at the Lajido in a way dominated by heather and then by basaltic slabs. 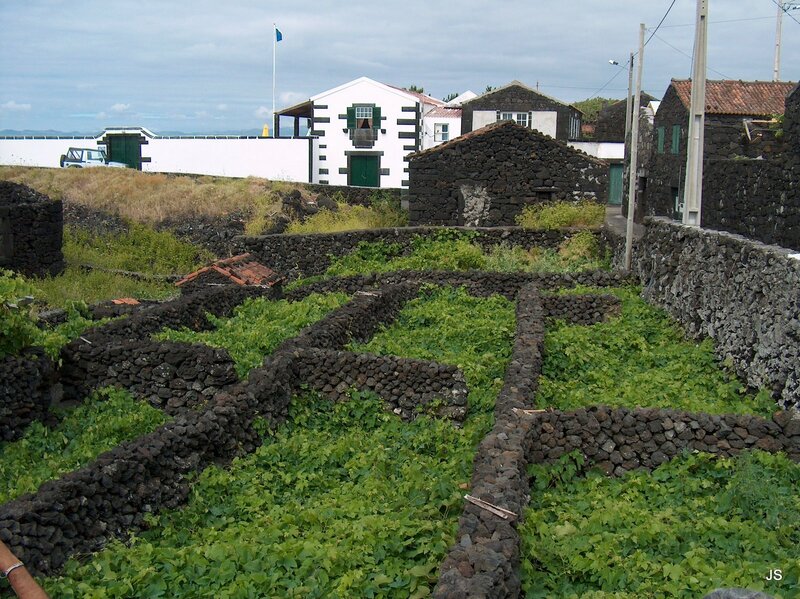 In Lajido Santa Luzia, there has been a group of houses and cellars built in basaltic stone, featuring Pico. A place worth a visit is the Museum Centre of Lajido.